EAT YOUR WAY THROUGH TRINIDAD’S QUIRKY HISTORY! Come on one of our tasty street food tours to experience some of Trinidad's most authentic and unique foods while supporting community tourism. 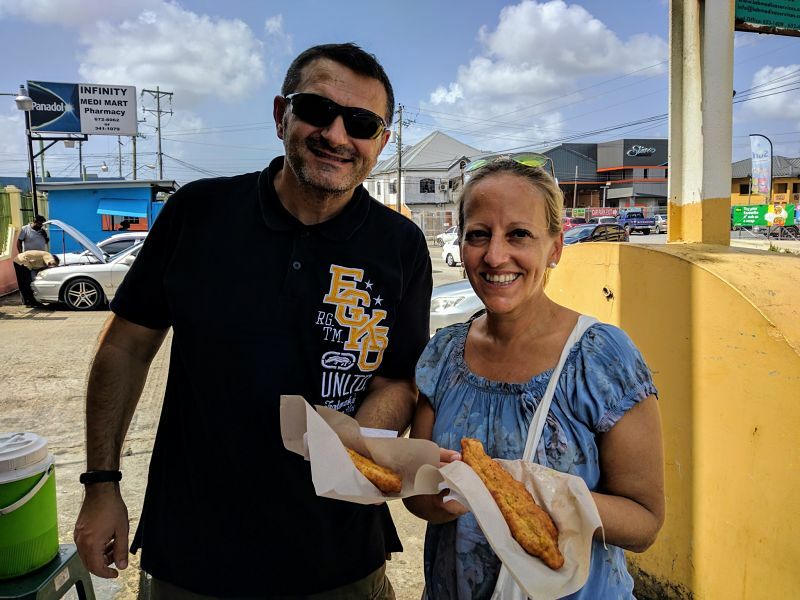 Through each tour you will learn how Trinidad's history is reflected in our foods while experiencing them from some of our favourite street vendors just like the locals do. How fun does that sound?! Our rates include ALL food! Your guided driven tours include at least 4 stops of FULL servings! This is no ordinary “tasting” food tour! You'll experience authentic Trinidadian street food in different communities while mixing with the locals; very off the beaten path! You're picked up and safely returned to your hotel! We also offer good old fashioned sightseeing tours. Choose more tour types from the menu above. Solo travellers are welcome! You can tour with us even if you're travelling on your own. Put this tour on your list of things to do in Trinidad at night! Join us on this driving tour to experience some of Trinidad's exciting street food while learning how they were affected by our history. On this tour, you will experience some of our night time treats such as doubles, corn soup, roti, pork sandwiches, and more! This driving tour takes place in the afternoon so we suggest you have a very light lunch as it will be a very filling experience. You will be sampling chicken samosas, different types of fritters, pastries, fresh coconut water cut open with a few swipes of a machete and a visit to a beautiful Hindu temple built in the sea. This is not our typical food tour; this is a markets and brunch tour! We will be visiting a regional market located in a growing agricultural town and a farmers' market, located in a very scenic and lush valley. On this tour you will be immersed in agricultural life in Trinidad, while having brunch stops along the way. This driving tour will positively overwhelm your senses with sights, sounds, smells and tastes!